Demonstrators are demanding the ouster of President Omar Bashir, who has been in power since 1989. The sub-Saharan nation has been gripped by soaring inflation, a weak currency, and food shortages. Protesters in Sudan took to the streets on Sunday for a fifth day, facing tear gas and arrests, as a wave of unrest has gripped the sub-Saharan nation since Wednesday. The protests were triggered by a steep increase in the price of bread, a staple for most Sudanese, but are also related to ongoing food and fuel shortages. Demonstrators have demanded that long-time President Omar Bashir step down. In Omdurman, just across the River Nile from central Khartoum, protesters chanted "The people want the fall of the regime" and "Freedom! Freedom!" Demonstrations have taken place in several other cities. 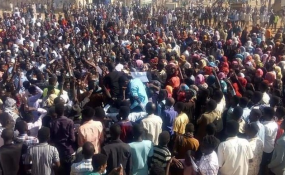 Some 600 residents in the city of Um Rawaba, 200 kilometers (125 miles) southwest of Khartoum, gathered in the market chanting "the people want the fall of the regime," Agence France Presse reported. Protesters burnt tires and branches in the streets and attempted to storm a government building before being repelled by security officials, witnesses said. As protests have mounted, an umbrella coalition of professional unions announced an indefinite doctors strike on Sunday, a move that is expected to be the first of several work stoppages. Since the unrest began on Wednesday, police have used tear gas against demonstrators and authorities declared states of emergency and curfews in several states to impose order. According to official figures, at least eight people have died in clashes with police. But Sudan's main opposition leader Sadiq al-Mahdi said the death toll stood higher, with 22 people falling victim to what he said was "armed repression." Meanwhile, Sudan's military pledged its support for President Bashir. "The armed forces assert that it stands behind its leadership and its keen interest in safeguarding the people's achievements and the nation's security, safety along with its blood, honor and assets," a military statement said. The sub-Saharan nation has been suffering from economic difficulties that include an acute foreign currency shortage and a soaring inflation, currently running at close to 70 percent. Shortages of fuel and food have several cities, including Khartoum, in the past three weeks. President Bashir has long been a member of Sudan's military establishment, which has dominated the country in the six decades since independence from Anglo-Egyptian rule in 1956. He came to power after he joined forces with Islamists in a 1989 military coup that toppled a freely elected but largely ineffective government.